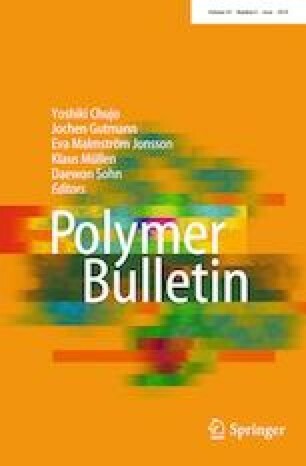 Well-defined side-chain ferrocene-containing polymers have been synthesized by post-modification of well-defined polyacrylonitrile (PAN). PAN prepared by Cu(0)-mediated single-electron transfer living radical polymerization was further modified using sodium azide and ammonium chloride (NH4Cl) to yield polymeric materials with vinyltetrazole units. Side-chain ferrocene-containing polymer was prepared by vinyltetrazole units and hydroxymethylferrocene after Mitsunobu reaction. FTIR, 1H NMR, UV–Vis spectroscopy and thermogravimetric analysis were used to identify the structure of the target product. After linked the ferrocene unit, the final polymer showed typical redox property with a more negative redox potential (E1/2). The study was financially supported by the National Natural Science Foundation of China (Nos. 51773086, 51573075 and 21501087), the Project of Shandong Province Higher Educational Science and Technology Program (No. J16LC20 and J18KA080) and the Program for Scientific Research Innovation Team in Colleges and universities of Shandong Province.